Is the Lite much of a downgrade? We answer all of that below, as we compare and contrast the Fitbit Versa to the Fitbit Versa Lite across all the areas that matter. The Fitbit Versa and Fitbit Versa Lite have a very similar design, so much so that you’re unlikely to be able to tell them apart at first glance. They both have a rectangular aluminum body with rounded corners, however, while the standard Fitbit Versa has three buttons to help you navigate – with two on the right edge and one on the left - the Fitbit Versa Lite has just one button, with the two on the right absent. 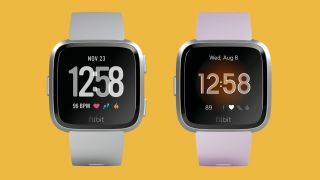 The two models are also available in different colors, with the Fitbit Versa coming in all black, or with a peach strap and a rose gold body, or grey with a silver body, while the Versa Lite comes in white with a silver body, lilac with a silver body, mulberry, or marina blue. The straps in all cases are silicone, though there’s also a Fitbit Versa Special Edition, which comes with a slightly classier woven strap in charcoal or lavender. It’s worth noting also that both the Fitbit Versa and the Fitbit Versa Lite are water-resistant to depths of 50 meters. As for the screen, it’s a square 1.34-inch 300 x 300 LCD one on both watches and in both cases it’s a color display. The screen on both watches can also reach 1000 nits of brightness and uses Gorilla Glass 3 for protection, so there’s not much to choose here. Key features of the Fitbit Versa Lite include steps and calorie tracking, sleep tracking, a heart rate monitor, more than 15 exercise modes, notifications from your phone, access to apps and clock faces, and female health tracking. The standard Fitbit Versa unsurprisingly offers all of that, but it additionally offers on-screen guided workouts, lets you store and play music, lets you make contactless payments with Fitbit Pay, and tells you how many floors you’ve climbed. Plus, while both wearables are swim-safe only the standard Versa will actually track your laps in the pool. Battery life is rated by Fitbit at four or more days for both the Versa and the Versa Lite, though this will of course depend on how you’re using them. In our own tests those claims mostly hold up, meaning the two wearables have similar battery life, though the Versa Lite’s might be slightly better, as we often found we could get 4-5 days from that, while the standard Versa tended more towards 3-4. While most things so far have come out in the Fitbit Versa’s favor, price is one thing that doesn’t, as it costs £199.99 / $199.95 / AU$299.95, while the Fitbit Versa Lite is $159.95 / £149.99 / AU$249.95. So the Fitbit Versa Lite costs around 25% less in most regions. Having said that, this is the full RRP we’re talking about, but we’ve already seen the standard Versa drop as low as £135.99 / $145 in sales. Of course, the newer Fitbit Versa Lite will probably also be reduced during sale periods, but if not then it could at times be a tough sell. Ultimately, the biggest differences between the Fitbit Versa and the Fitbit Versa Lite are that the former supports contactless payments and music, but costs a bit more. There are other differences, covering features, battery life and design, all of which we’ve highlighted above, but they’re mostly minor. So the decision really is how much those extra features are worth to you. If you really want them then go for the Versa, but if they’re not things you’d use much then the Versa Lite is just as good in most ways, and generally costs less.